The Shimano TR200G is a bit of a star drag reel. It also has a heavy duty level line to take the guess work out of laying line evenly across the spool. The advantage of star drags is that the gears are completely disengaged to allow for the best possible casting performance. 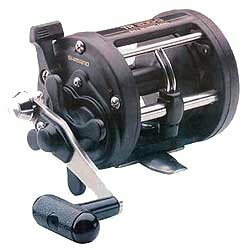 A star drag reel totally disengages the spool when casting. The TR200G is a smaller reel which holds some 360 metres of 8 kg line (300 yards of 20 lb monofilament). It has a gear ration of 4.3:1. The one-piece frame is constructed of super tough yet light weight graphite. The TR200G has an almost identical twin brother the TR2000LD. The later model is essentially the same except for a slightly lower gear ratio of 4.2:1 and also features an upgrade to three ball bearings from the single ball bearing in the more budget conscious TR200G. This reel is often supplied for anglers to use on charter boats where it can be fished with confidence by those with a bit less fishing experience. Yet at the same time it is a quality product which is extremely rugged and versatile. Great for trolling, bait fishing over reefs, casting a lure and jig fishing. Other features include: alloy spool, click alarm, titanium drag system, weight: 375 grams (13.5oz).